Update: The technique outlined here for reverting to iOS 7 no longer works as Apple has stopped signing versions of iOS prior to iOS 8. As summer winds down and autumn kicks in, it’s time for another iOS update. And, just as predictably, a lot of iPhone, iPad, and iPod touch owners will want to make the leap from the previous operating system to the new one. If tradition holds, Apple will release iOS 8 at around 10 a.m. Pacific (1 p.m. Eastern) on Wednesday, and when it does, this guide will show you the way. Because it comes as a surprise to a lot of people, it’s important to know the following from the get-go: Once you update your device to iOS 8 there’s very little chance that you’ll be able to revert to a previous version. Apple stops “signing” (authorizing) older versions of iOS just days after releasing a new one. Reverting during this brief window is possible (and we'll explain how at the end of this story). But once that window closes, there’s no going back. 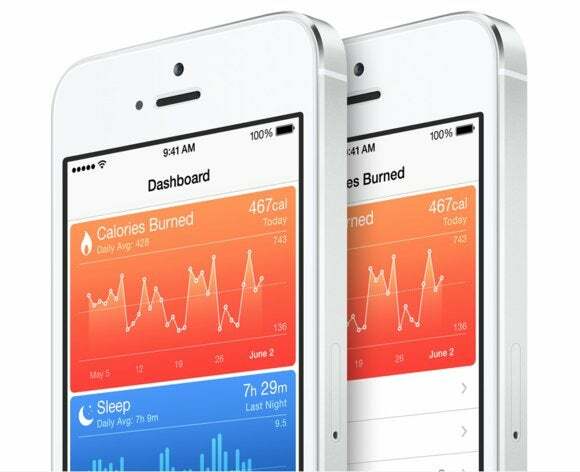 For many, the jump from iOS 6 to iOS 7 was jarring because of iOS 7’s new look. With regard to design, iOS 8 is more refinement than revolution. So if you’re comfortable with the way iOS 7 looks and operates, you should have little problem with iOS 8’s interface. That said, as this is a brand-new version, there are likely to be glitches—some third-party apps may not yet be fully compatible with iOS 8, for example. For this reason you may wish to delay upgrading. Keep an eye on stories here and an ear open to friends, family, and colleagues who may have taken the step. When your key apps are updated, and you hear no complaints, it may then be time to upgrade. iOS 8 is compatible with most iOS device made in the last few years. Earlier iOS devices are incompatible with iOS 8. Some of the older devices that are compatible, such as the iPad 2 and iPhone 4s, may not support all of iOS 8’s features or may perform less than optimally with it. (New operating systems can demand more of a device’s processor and thus cause older devices to be less responsive.) With that in mind, if you have an iPad 2 or iPhone 4s, you may wish to delay upgrading until you’ve read reports of their performance under iOS 8. Before committing to the upgrade there are steps you should take before doing so. The first is to back up the data on it. You can do this in one of two ways: either by connecting your iOS device to your computer and backing it up to iTunes, or by backing it up to iCloud. In this case, I'd encourage you to choose the first option. If it comes time to restore your data and apps, you’ll find that doing so from iTunes is a lot faster than from iCloud. Let’s start with the steps for backing up to your computer. Launch iTunes on your Mac and, if you haven’t enabled Wi-Fi sync, string your device’s syncing cable between it and your iOS device. Select your device in iTunes, choose the Summary tab, and in the Backups area of the resulting window click on Back Up Now. If there are apps on your device that aren’t in your iTunes library, a window will appear asking if you’d like to back them up. The choice is yours, as you can always re-download any you’re missing from the iTunes store. iTunes will now set about backing up any apps on the device that aren’t in your iTunes library as well as other data the device contains. You'll find that restoring your data takes less time if you back up your iOS device to iTunes. This would also be a good time to back up any purchased content on the device. To do that, choose File > Devices > Transfer Purchases From [name of device]. Any purchased media on the device will be backed up to iTunes. 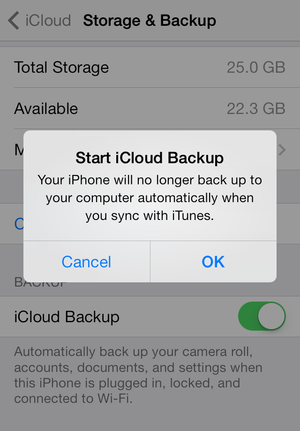 You can choose to back up your data to iCloud directly from your iOS device. Alternatively, you can wirelessly back up your device to iCloud. You can initiate this in two ways. The first is to access the Summary tab in iTunes and in the Backups area enable the iCloud option (as seen in the image above). 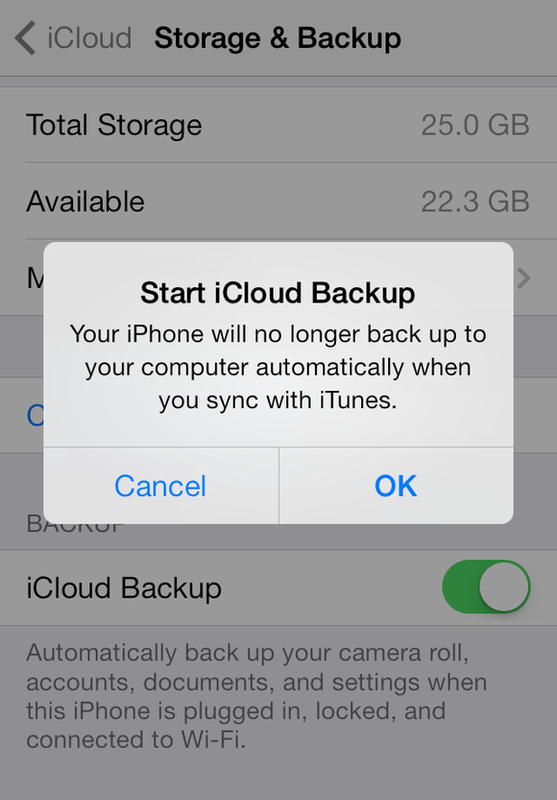 The other is to choose to back up to iCloud from the device itself. You do this by going to Settings > iCloud > Storage & Backup and in the resulting screen enabling the iCloud Backup option. An alert appears informing you that your data will now be backed up to the cloud. Tap OK to allow that to happen. If you’ve enabled iCloud’s Find My [Device] feature to help you track it should it be lost or stolen, you’ll have to turn it off before you can upgrade to iOS 8. This is a security precaution introduced with iOS 7 to help prevent bad guys from wiping your device after stealing it. To do this, go to Settings > iCloud > Find My [Device]. Switch the toggle to Off and you’ll be prompted for your Apple ID password. (This is not the security code you may have set up for the device but rather the password you use with iCloud and with the various online Apple stores.) Enter that password, tap OK, and the feature will be switched off, allowing you to update your device.